While I was on vacation last weekend, we went to a German beer garden, and this was written on one of the tables. 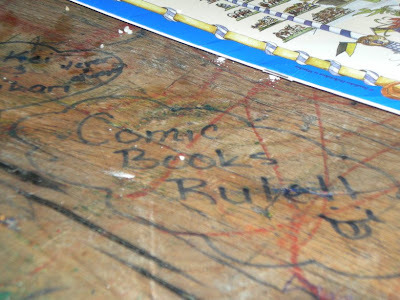 It says "Comic Books Rule!!" hahah. that's an awesome photo! what makes me really laugh, though, is what the conversation that precipitated this graffiti entailed. "Who would win? Aquaman or Spiderman?" "On land or in water?" "Water...but let's say Spiderman can hold his breath for a really long time." "So what you're really asking is, 'Who would win, Aquaman or Michael Phelps?" "Good point. Phelps would own."